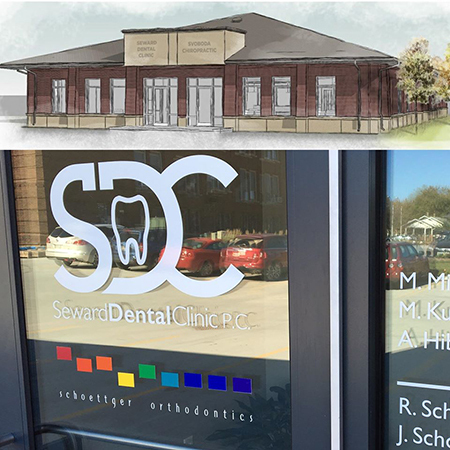 We are so proud to announce that today is the FIRST day of our collaboration with the Seward Dental Clinic PC in their beautiful, brand new building at 306 S. 4th Street in Seward! To better serve all of our patients and their families, Dr. Jared will now provide orthodontic care there on select Fridays! We are scheduled there a few times before the holidays, and then starting in January we will be there every other Friday regularly. Seeing orthodontic patients in Seward will open up clinic time in our Lincoln office as well, since our existing Seward families now have the option to be treated in their own community. We will also continue to be open in Lincoln every other Friday morning, keeping even more times open for everyone! We want to thank Drs. Minchow, Kunasek, and Hibbert for making this possible!